A Habitat for Humanity ReStore is a non-profit home improvement store and donation center that sells new and gently used furniture, appliances, home accessories, building materials and more to the public at a fraction of the retail price. 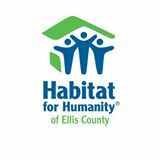 Our ReStore is independently owned and operated by Habitat for Humanity of Ellis County. Our ReStore is operated entirely by dedicated volunteers. Donated goods and monetary donations are tax-deductible. Proceeds are used to help build strength, stability, self-reliance and shelter in local communities and around the world. We are conveniently located at 2918 Vine Street, in front of Dollar Tree in the Big Creek Crossing Mall Parking Lot in Hays, Ks. Our hours are from 9 am to 2 pm. We are closed on holidays. Big Creek Crossing is donating the space for the ReStore to HFHEC with the understanding that if a commercial venture wishes to use the location, HFHEC will have to vacate the space. HFHEC pays all the utilities. Eligible donations may be brought into the Habitat ReStore during store hours, or you may call or text (785) 639 - 7491 to schedule a donation pick up. We prefer complete kitchen cabinet sets, but will accept individual cabinets with all parts included, depending on the cabinet type and its inventory. lighting fixtures that are in working condition. Want to volunteer at the ReStore? Do you have items to donate? Thank you for supporting the ReStore over the years!